I have the above & I need a new transfer kit, do you do them? I am unsure if it is a M551n, M551dn or M551xn. If you can tell from just the info I gave, great. If you need more info, please let me know, I will do my best! Hi Sandy, thank you for your question about HP transfer kits. Unfortunately the only maintenance items we stock for the HP LaserJet Enterprise 500 Colour M551dn, HP LaserJet Enterprise 500 Colour M551n and HP LaserJet Enterprise 500 Colour M551xh are the fuser unit and the waste toner collector. We do not stock the transfer kit at this time I am afraid. Does the HP laser jet colour printer M551 DN have a waste toner bottle that needs replacing? Kindly advise me if I need to replace a plastic small container on the left-hand side of the ink cartridges in my LaserJet Colour M551n printer or if I just need to clean it out? Thank you, Paula. What is the product number for a waste toner bottle that works in the HP LaserJet 500 Colour M551n printer? The compact HP LaserJet M551n is suitable for personal and home office use. 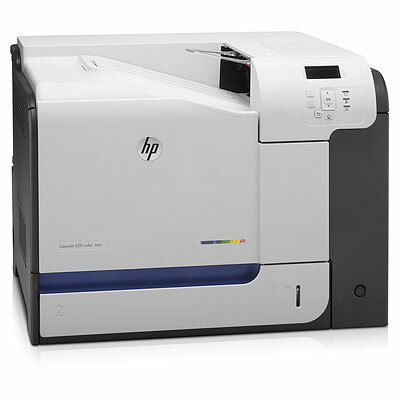 It boasts a speed of 32ppm for coloured and black prints and uses HP's laser print technology, enabling it to print professional flyers and brochures. The memory is a standard 1GB and processor speed is 800MHz. Having dimensions of 514 x 491 x 385 mm, the M551n is easy to fit in small offices and tight spaces. The 4-line display makes it easy to use, and it boasts wireless printing technology. Two paper trays are included; a third is optional. This basic laser printer has HP's signature eco-friendly features, including the Auto On/Off Technology, which saves time and energy. The M551n also uses HP EasyColour technology, which detects the content of the document and automatically adjusts the colour for streamlined printing and optimized photos. Unlike the other products from the M551 family, the HP LaserJet M551n is just a printer. It does not have a USB port, a Hardware Integration Pocket, and High Performance Secure Hard Disk. The usual automatic 2-side printing feature is missing. This printer is not suitable for heavy duty printing, but is good enough for less demanding environments.